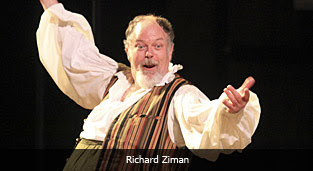 Richard Ziman plays a great Falstaff in the production of Henry IV, Part 2, now playing in the Shakespeare Santa Cruz Festival Glen. This is a play well worth seeing (and a play that is not often performed). You can still take in the play, if you haven't already seen it, by clicking on the Shakespeare Santa Cruz link. Tickets to this, and other Shakespeare Santa Cruz performances, are available online. Performances will continue until August 26th. I am no friends of Kings, as I have said before, but I will say that I was quite touched by the transformation of Prince Hal from "friend of Falstaff" to "King of England." When called upon to play his new role, the wastrel Prince stepped up, put on the robes of responsibility, and repudiated his past. Shakespeare, of course, is famous for making clear to us that we are defined (and ennobled, or not) by the roles we are given to play on the stage of life. I still don't like Kings, but the play I saw last Saturday made me think that we all need, now, to step up to the role of "Citizen." This role, too, requires us to push idle pleasures to the past, and to assume the hard responsibilities of the role we may not have chosen, but that is ours to perform.